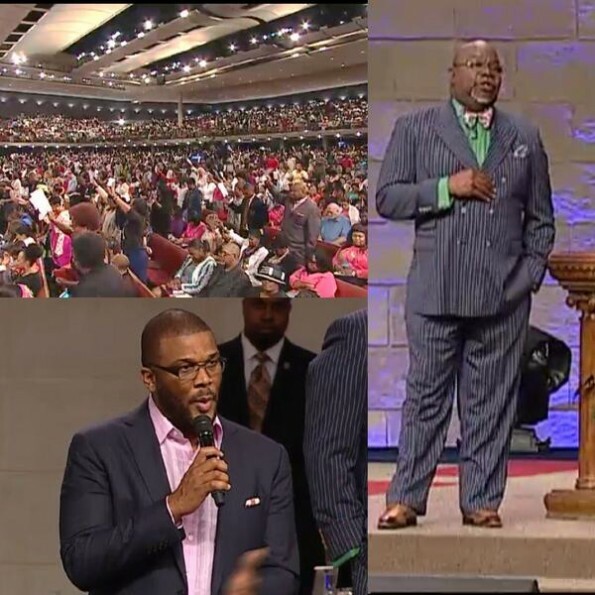 The word of God came alive over the weekend at Bishop T. D. Jakes' mega church, The Potter's House, proving that it is more blessed to give than to receive. For those of us that were streaming live, you could feel an electrifying move of God over the internet on the morning of September 1, 2013 - an extra-ordinary climax I believe to the Megafest celebration that was held in Dallas August 29-31, 2013. The power and the move of God was further demonstrated when mega pastor Bishop Jakes announced that the church would be building a new youth center, not just for the youths of that city, but youths from all across the nation. Shortly after that announcement, 43 year old Hollywood movie-producing mogul Tyler Perry who was present, stood up to share with the packed audience what God told him to do. He tearfully explained how God had told him to give $1 million dollars towards the cause. Through his testimony, he proved how he has the art of giving down to a science. He shared how much he just loves to give and how much he loves the youths. He also shared that his mother did not have money, no legacy or anything like that to give, but one thing, she's got is Jesus. It is that same Jesus that came alive in him on that day - a day that is sure to go down in the history books that God can do anything, but fail. That God can use anyone that He please to show forth His mighty power, presence and His glory here on earth as long as you are obedient and would yield to His Holy Spirit and His voice. 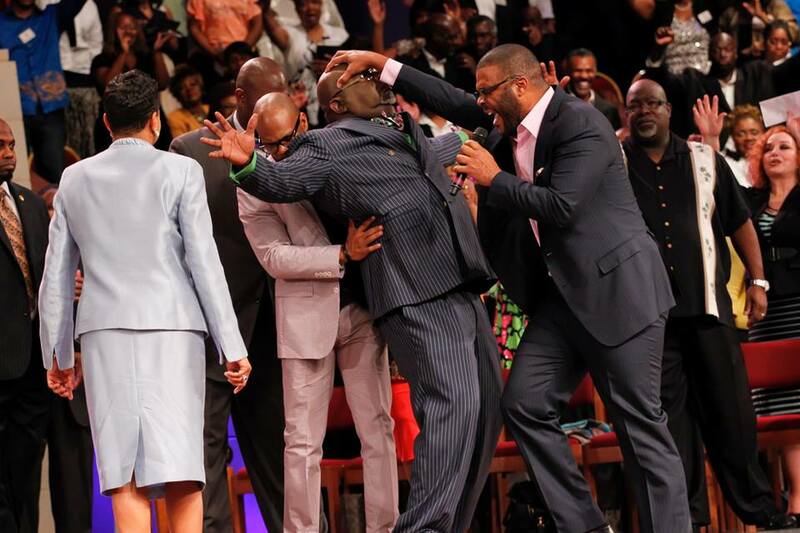 Speaking in an unknown tongue, Tyler Perry, proceeded to lay hands upon Bishop Jakes, who evidently, received more power and anointing in his life as Perry spoke into his [Bishop Jakes'] life. Here are some of the tweets that were streaming live..
#tphonline I'm still recovering from the message that Tyler Perry preached. It's go time. There's an army rising up and I'm in that number. In addition to catching heat from some critics, there are those that suggest that the New Orleans native is not only leaving an imprint in Hollywood (and TV via OWN for that matter), but is also an example of a celebrity who continuously gives back in public and private. He now leaves an exemplary mark in God's Kingdom here on earth that he lives his life knowing that God is in control of it. EMB takes this time out to congratulate Tyler Perry, Bishop T.D. Jakes and The Potter's House and to say that we were truly blessed to be a part of this history making moment in the body of Christ. Oh wow! A divinely orchestrated transfer of wealth into the kingdom of God. To Him be all the glory, honor and praise! Amen indeed to God be all the glory. Glory to God...Hallelujah!!!! wonderful. It is more blessed to give than to receive, indeed. Amen Ava and proof of how the glory of the Lord fills the earth....and the young men are prophesying, having dreams, visions and are speaking with new tongue. All the praise be to God. Hi Michelle, absolutely! There is a harvest to be reaped from among our youths and more labourers to lend their hand and give of their resources in whatever possible.